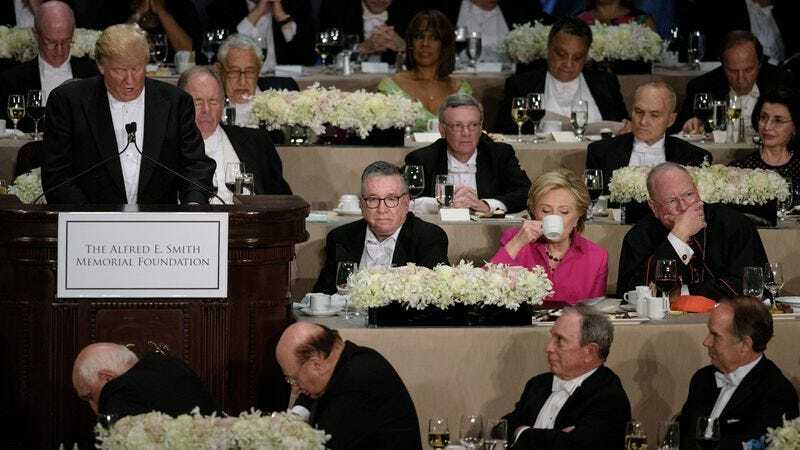 Traditionally, the Alfred E. Smith Memorial Foundation Dinner, held each year as a fundraiser for Catholic charities, is an opportunity for the major-party candidates to diffuse the tension of the more formal presidential debates by delivering good-natured comedic speeches. Traditionally. But, as even aliens from another galaxy surely would have realized by now, this is not a traditional election. All of which to say is that, if his plan to plop himself down on the sidewalk and throw a temper tantrum should he lose the election on November 8 doesn’t work, Donald Trump has to start examining his career options. And he should probably cross “stand-up comedian” from the list. Clinton, for her part, seemed to be in good spirits, and was among the first to laugh at Trump’s comments about her. She also couldn’t help getting in a few personal jabs at her opponent, saying, “Donald looks at the Statue of Liberty and sees a four, maybe a five if she loses the torch and tablet and changes her hair.” And, with Cardinal Timothy Dolan sitting between them, the candidates engaged in friendly small talk throughout the evening, eventually shaking hands before they left. In the interest of fairness, you can watch both candidates’ full speeches, courtesy of the lamestream media operatives at C-SPAN, below.